Dr. Ann Frisch was the speaker at the Rotary Peace Foundation. Here is some information about her and the Nonviolent Peace Force. Dr. Ann Frisch served on the Nonviolent Peaceforce team in Guatemala that protected human rights defenders during the violent elections there in 2007. On October 2, 2010, she presented unarmed civilian peacekeeping at the meeting of the Peace and Justice Studies Association in Winnipeg, Canada. The theme of the meeting was “Building Bridges, Crossing Borders: Gender, Identity and Security in the Search for Peace.” The meeting also celebrated the 10th anniversary of UN Security Council Resolution 1325, which calls on all parties to involve women in the highest levels of decision making. Unarmed civilian peacekeeping is a movement you can say “yes” to in an era of gross violations against human rights, assaults on human rights defenders and increasing numbers of civilian casualties of armed conflict. The United Nations is engaged in the important work of moving the world toward protection of conflict-affected civilians, and is working to acknowledge the needs specific to the protection of women and girls. Equally important to providing protection to civilians is the expectation of the UN that individuals and groups will join with member states to protect human rights, guaranteed in the Universal Declaration of Human Rights in 1948 and subsequent declarations such as the UN Convention on the Rights of the Child and the conventions on genocide, protection of children and women in armed conflicts, and many more. UN Security Council Resolution 1325 and its successors affirm the importance of women being involved in peacekeeping, peacemaking and reconciliation at the highest levels of decision making. But not surprisingly, there was bad news about peace and justice at this meeting. Evaluations of the effect of these resolutions indicate that armed UN peacekeepers have not provided the mandated protection to civilians, and in some cases have been involved in committing violence toward them. Neither women nor other civilians have been involved significantly at the highest levels of decision making even under UN auspices. Human rights defenders are under siege in many areas, even by some UN member states. A variety of reasons have been offered for these failures, including over-reliance on resolutions, mandates and operating procedures to protect and involve civilians. Efforts to date have been mostly top-down in a status quo-oriented bureaucratic organization. The UN does intervene with unarmed staff in many situations. However, it relies heavily on armed UN peacekeepers to do the major work of protecting and involving civilians in resolving conflicts, which is a role better performed by civil society organizations. The good news is that the world does not need to wait until the UN machinery can do that work: It is already being done by Nonviolent Peaceforce. We have trained professional, gender-balanced civilian teams from around the world already successfully providing unarmed protection. In Mindanao, the Philippines, Nonviolent Peaceforce was invited by the armed parties to the conflict to be on the International Monitoring Team (IMT). Our partner organizations (compromised of women and men) are also seated on the IMT. For example, Bantay Ceasefire Humanitarian Protection, a member of the Mindanao Peoples Caucus, has a thousand volunteers who monitor human rights in Mindanao including a team of all-woman unarmed peacekeepers. Together with the powerful local civilian groups, we are a remarkable force for peaceful resolution of conflict. Nonviolent Peaceforce has 88 peacekeepers here working with the Mindanao Peoples Caucus. In Sudan, where any spark could ignite a humanitarian crisis, there are signs of hope. Nonviolent Peaceforce provided neutral safe space and protected local authorities, who prevented violence between people whose cattle had been stolen and those who stole them. The successful resolution of this dispute brings promise of more collaboration between conflicting parties. In a country where 50 percent of the population is under 17, Nonviolent Peaceforce is providing protection to children who have to struggle with the fact that their parents and those of their classmates are often opponents from conflicting tribes. Imagine teachers and students working together to create unarmed security in their schools so they can get on with their schooling and building better futures for themselves. In Sri Lanka, the searing violence in Batticaloa in 2009 that followed several murders and abductions risked spreading to nearby Valaichchenai. But it did not. Nonviolent Peaceforce had been providing protection to civilian-based organizations in Valaichchenai since 2003. We worked with women and men of diverse ethnicities and religions, ages and occupations to create early-warning systems, rumor control and youth outreach. We also partnered with local civilian society organizations committed to preventing violence. These efforts so strengthened the community of Valaichchenai that it was able to maintain peace despite the upheaval in Batticaloa. In the last few months, 50 people (three-fourths of them women) participated in training for unarmed civilian peacekeeping to provide real security for their communities. Following the training, a group of trailblazing women won the release of two men who had spent over a year in prison. Imagine the joy of having your community secure and your family safe at home. For the same dollars the world’s militaries expend in one day, Nonviolent Peaceforce could put 50,000 unarmed civilian peacekeepers in the field for a year. Nonviolent Peaceforce teams enter communities by invitation from local groups working on human rights and reconciliation in areas of deeply rooted violent conflict. Our nonpartisan unarmed civilian peacekeepers protect civilians, work to bring armed parties in conflict together for talks, and create spaces for women and men to do the work of peacemaking in their communities. Imagine peace breaking out everywhere with unarmed peacekeepers protecting the people who are working to keep schools safe, seeds sown, families secure, crops harvested and shops tended. These standards represent important steps forward for humankind. We must seize the day and move quickly under the banner of these standards to the large-scale implementation of unarmed civilian peacekeeping. agine all of us feeling safe enough, no matter where we live, to openly work for peace, building bridges — roads and relationships — going to work, and taking care of our children, our parents and our communities. We celebrate that we the people are at this moment seizing the great UN mandates to make this happen through unarmed civilian peacekeeping. Dr. Ann Frisch is presently cochair of the U.S. Nonviolent Peaceforce Fund Raising Board. She served on one of the early Nonviolent Peaceforce teams in Guatemala protecting human rights defenders during the violent elections there in 2007. She is professor emerita, University of Wisconsin — Oshkosh, and is a member of the Peace and Justice Studies Association. With the headquarters in Brussels, NP peacekeeping teams are presently deployed in the Philippines, in South Sudan, and the South Caucasus. Our peacekeepers include veterans of conflict zones, experienced peacekeepers, and those new to the field with the right combination of experience, skills, aptitude and attitude. Nonviolent Peaceforce USA is a 501(c)(3) nonprofit organization. To create a space for fostering lasting peace. To protect civilians, especially those made vulnerable because of the conflict. To develop and promote the theory and practice of unarmed civilian peacekeeping so that it may be adopted as a policy option by decision makers and public institutions. The mission of Nonviolent Peaceforce is to promote, develop and implement unarmed civilian peacekeeping as a tool for reducing violence and protecting civilians in situations of violent conflict. We envision a world in which large-scale unarmed civilian peacekeeping using proven nonviolent strategies is recognized as a viable alternative in preventing, addressing, and mitigating violent conflicts worldwide. Our primary strategy for achieving this vision is the creation of space to foster dialogue. We most often respond to invitations by credible local organizations committed to nonviolent solutions. Once invited, we meet key players, including commanders from opposing sides, local police, religious, business, and civil society leaders. We live and work in communities within conflict zones alongside local people. When violence erupts, civilians under threat often contact us. They know and trust us. We have been living among them. Visibly nonpartisan and unarmed, we arrive in NP uniforms, with NP vehicles, letting our presence be known. We build the confidence and safety of civilians deeply affected by conflict so they can access available structures and mechanisms for addressing problems and grievances. Our activities have ranged from entering active conflict zones to remove civilians in the crossfire to providing opposing factions a safe space to negotiate. Other activities include serving as a communication link between warring factions, securing safe temporary housing for civilians displaced by war, providing violence prevention measures during elections and negotiating the return of kidnapped family members. David Hartsough had long been committed to creating a better world through nonviolent means. The Quaker activist protested racial segregation in lunch counter sit-ins in the 1960s, demonstrated against the Vietnam War and nuclear proliferation, and trained civilians in Kosovo in nonviolent strategies during the 1990s. Mel Duncan’s vision began when he went to Nicaragua with the coffee/cotton brigades during the Contra war in 1984 and saw that villages were not attacked when foreigners were present. David and Mel met at the 1999 Hague Appeal for Peace, each seeking support to make his vision an organized entity. After hearing David’s presentation, Mel shared his ideas with him. David and Mel immediately saw the powerful symbiosis. By the end of the event, they, along with others who caught the vision, were organizing to lay the foundation for Nonviolent Peaceforce. As they and others began organizing NP, they talked to people around the world. Amid the fiercest violence, they met courageous and creative peacemakers who told them time and again that isolation was lethal and international accompaniers extended their lives and amplified their work. Nonviolent peacekeeping is a common vision that has flowed through Gandhi, Maude Roydon, Badshah Khan and so many others. It has occurred and recurred to enough people for generations that now many focus their lives and resources on making it real. David, Mel and their fellow founders constituted Nonviolent Peaceforce in the 2002 Convening Event in Surajkund, India with peace advocates from 49 countries in attendance. One year later, in fall 2003, Nonviolent Peaceforce had its first team in Sri Lanka. Thank you to all of you who have joined. This entry was posted in Nonviolence, Rotary Peace Forum, Speaker on 30 January, 2013 by Peacefull. Many were excited at the speech of Aung San Suu Kyi. We heard two addresses. One was to young people and the other to the Rotary Peace Forum. What I noted with the children’s session was that the MC spoke for them, I would have loved to have heard their voices rather than have them stand up. It is another form of control, perhaps the teachers thought it was a better way, but it is so important to hear the voices of children, they have much to teach us. Aung San Suu Kyi said she is interested more in the questions as it tells her a lot about the answer. Questions also show depth and awareness, the questions by the young people were excellent. This kingdom is simply the place of virtues where the power of love is the real power. She saw compassion as the real courage, I would agree with that. Aung San Suu Kyi only accepted the invitation to speak at this forum because of the peace theme, she was interested in peace and prosperity in her country and recognised the business people in Rotary and the infrastructural work they do and the desperate need of her people. She also acknowledged the need for conflict resolution, education, water, free health care and healing for her people. All the years under military occupation had decimated her country making it one of the poorest in Asia. She spoke at length about corruption and the lack of ethics. In asia this is a big issue, the kick backs the money exchanging hands even in the community, in hospitals, schools and so on. Everyone wanted more. Even in the case of hospitals the poor people had to supply all the medical equipment, they are the poorest of the poor. Such is the notion of poverty and lack of ethics combined. The people suffer enormously. This for me was the theme today the suffering of people needlessly, the lack of empathy and the desire for real peace. Aung Sun Suu Kyi saw it as compassion and courage. The courage to admit mistakes, the courage to make changes, rather than seeing courage at the end of a gun. In truth it is the opposite to courage. It took her 20 years to get a dialogue started with the military as they saw win/lose. She said they thought if they dialogued they would lose all rather than share through negotiation. Such was the mindset of the military, an intractable position where the people increasingly suffered, ethnic tensions increased, innocent people were imprisoned and tortured, children suffered malnutrition due to worms. There was a constant sense of insecurity, no safe place to rebuild their country, distrust ethnically and toward the military, so much hardship and hatred. How can one grow compassion in such a traumatised environment. Only love has the patience to try and is brave enough to envisage a peaceful society in harmony. She is one such person who has that vision. All need to come together now, military, civilian, bureaucrats etc. it is time to resolve differences, to question intentions, to look at our beliefs and the shape of the world and decide what world we truly desire for our children. I see that decision very clearly and I see the time as now. Here is an overview of her life by wikipedia. Aung San Suu Kyi MP AC (Burmese: ; MLCTS: aung hcan: cu. krany, /aʊŋˌsæn.suːˈtʃiː/, Burmese pronunciation: [àʊɴ sʰáɴ sṵ tɕì]; born 19 June 1945) is a Burmese opposition politician and chairperson of the National League for Democracy (NLD) in Burma. In the 1990 general election, the NLD won 59% of the national votes and 81% (392 of 485) of the seats in Parliament. She had, however, already been detained under house arrest before the elections. She remained under house arrest in Burma for almost 15 of the 21 years from 20 July 1989 until her most recent release on 13 November 2010, becoming one of the world’s most prominent political prisoners. On 1 April 2012, her party, the National League for Democracy, announced that she was elected to the Pyithu Hluttaw, the lower house of the Burmese parliament, representing the constituency of Kawhmu; her party also won 43 of the 45 vacant seats in the lower house. The election results were confirmed by the official electoral commission the following day. Later in that year, she was criticized by some activists for her silence on the anti-Rohingya riots in Rakhine State. 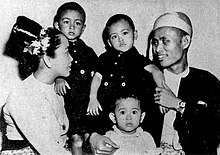 A family portrait, with Aung San Suu Kyi (in white) as a toddler, taken in 1947, shortly before her father’s assassination. Aung San Suu Kyi derives her name from three relatives: “Aung San” from father, “Suu” from her paternal grandmother and “Kyi” from her mother Khin Kyi. She is frequently called Daw Aung San Suu Kyi. Daw is not part of her name, but is an honorific, similar to madame, for older, revered women, literally meaning “aunt.” She is also often referred to as Daw Suu by the Burmese (or Amay Suu, lit. “Mother Suu,” by some followers), or “Aunty Suu”, and as Dr. Suu Kyi, Ms. Suu Kyi, or Miss Suu Kyi by the foreign media. However, like other Burmese, she has no surname (see Burmese names). Aung San Suu Kyi was born on 19 June 1945 in Rangoon (now named Yangon). Her father, Aung San, founded the modern Burmese army and negotiated Burma’s independence from the British Empire in 1947; he was assassinated by his rivals in the same year. She grew up with her mother, Khin Kyi, and two brothers, Aung San Lin and Aung San Oo, in Rangoon. Aung San Lin died at the age of eight, when he drowned in an ornamental lake on the grounds of the house. Her elder brother immigrated to San Diego, California, becoming a United States citizen. After Aung San Lin’s death, the family moved to a house by Inya Lake where Suu Kyi met people of very different backgrounds, political views and religions. She was educated in Methodist English High School (now Basic Education High School No. 1 Dagon) for much of her childhood in Burma, where she was noted as having a talent for learning languages. She is a Theravada Buddhist. Aung San Suu Kyi at the age of six. Suu Kyi’s mother, Khin Kyi, gained prominence as a political figure in the newly formed Burmese government. She was appointed Burmese ambassador to India and Nepal in 1960, and Aung San Suu Kyi followed her there, she studied in the Convent of Jesus and Mary School, New Delhi and graduated from Lady Shri Ram College in New Delhi with a degree in politics in 1964. Suu Kyi continued her education at St Hugh’s College, Oxford, obtaining a B.A. degree in Philosophy, Politics and Economics in 1969. According to a classmate, Suu Kyi fell in love with Tariq Hyder, a Pakistani student, during her second year in Oxford. Their relationship was not well received by her circle of friends and it soon ended. After graduating, she lived in New York City with a family friend Ma Than E, who was once a popular Burmese pop singer. She worked at the United Nations for three years, primarily on budget matters, writing daily to her future husband, Dr. Michael Aris. In late 1971, Aung San Suu Kyi married Aris, a scholar of Tibetan culture, living abroad in Bhutan. The following year she gave birth to their first son, Alexander Aris, in London; their second son, Kim, was born in 1977. Between 1985 and 1987, Suu Kyi was working toward an M.Phil in Burmese literature as a research student at the School of Oriental and African Studies in London. She was elected as an Honorary Fellow in 1990. For two years she was a Fellow at the Indian Institute of Advanced Studies (IIAS) in Shimla, India. She also worked for the government of the Union of Burma. In 1988 Suu Kyi returned to Burma, at first to tend for her ailing mother but later to lead the pro-democracy movement. Aris’ visit in Christmas 1995 turned out to be the last time that he and Suu Kyi met, as Suu Kyi remained in Burma and the Burmese dictatorship denied him any further entry visas. Aris was diagnosed with prostate cancer in 1997 which was later found to be terminal. Despite appeals from prominent figures and organisations, including the United States, UN Secretary General Kofi Annan and Pope John Paul II, the Burmese government would not grant Aris a visa, saying that they did not have the facilities to care for him, and instead urged Aung San Suu Kyi to leave the country to visit him. She was at that time temporarily free from house arrest but was unwilling to depart, fearing that she would be refused re-entry if she left, as she did not trust the military junta‘s assurance that she could return. Aris died on his 53rd birthday on 27 March 1999. Since 1989, when his wife was first placed under house arrest, he had seen her only five times, the last of which was for Christmas in 1995. She was also separated from her children, who live in the United Kingdom, but starting in 2011, they have visited her in Burma. On 2 May 2008, after Cyclone Nargis hit Burma, Suu Kyi lost the roof of her house and lived in virtual darkness after losing electricity in her dilapidated lakeside residence. She used candles at night as she was not provided any generator set. Plans to renovate and repair the house were announced in August 2009. Suu Kyi was released from house arrest on 13 November 2010. Aung San Suu Kyi arrives to give speech to the supporters during 2012 by-election campaign at her constituency Kawhmu township, Myanmar on 22 March 2012. Coincident with Aung San Suu Kyi’s return to Burma in 1988, the long-time military leader of Burma and head of the ruling party, General Ne Win, stepped down. Mass demonstrations for democracy followed that event on 8 August 1988 (8–8–88, a day seen as auspicious), which were violently suppressed in what came to be known as the 8888 Uprising. On 26 August 1988, she addressed half a million people at a mass rally in front of the Shwedagon Pagoda in the capital, calling for a democratic government. However in September, a new military junta took power. Influenced by both Mahatma Gandhi‘s philosophy of non-violence and more specifically by Buddhist concepts, Aung San Suu Kyi entered politics to work for democratisation, helped found the National League for Democracy on 27 September 1988, but was put under house arrest on 20 July 1989. Offered freedom if she left the country, she refused. Suu Kyi meets with Edgardo Boeninger of the National Democratic Institute for International Affairs in 1995. In 1990, the military junta called a general election, in which the National League for Democracy (NLD) received 59% of the votes, guaranteeing NLD 80% of the parliament seats. Some claim that Aung San Suu Kyi would have assumed the office of Prime Minister; in fact, however, as she was not permitted, she did not stand as a candidate in the elections (although being a MP is not a strict prerequisite for becoming PM in most parliamentary systems). Instead, the results were nullified and the military refused to hand over power, resulting in an international outcry. Aung San Suu Kyi was placed under house arrest at her home on University Avenue (16°49′32″N 96°9′1″E) in Rangoon, during which time she was awarded the Sakharov Prize for Freedom of Thought in 1990, and the Nobel Peace Prize the year after. Her sons Alexander and Kim accepted the Nobel Peace Prize on her behalf. Aung San Suu Kyi used the Nobel Peace Prize’s 1.3 million USD prize money to establish a health and education trust for the Burmese people. Around this time, Suu Kyi chose non-violence as an expedient political tactic, stating in 2007, “I do not hold to non-violence for moral reasons, but for political and practical reasons,” however, nonviolent action as well as civil resistance in lieu of armed conflict are also political tactics in keeping with the overall philosophy of her Theravada Buddhist religion. The media were also prevented from visiting Suu Kyi, as occurred in 1998 when journalist Maurizio Giuliano, after photographing her, was stopped by customs officials who then confiscated all his films, tapes and some notes. In contrast, Suu Kyi did have visits from government representatives, such as during her autumn 1994 house arrest when she met the leader of Burma, General Than Shwe and General Khin Nyunt on 20 September in the first meeting since she had been placed in detention. On several occasions during Suu Kyi’s house arrest, she had periods of poor health and as a result was hospitalized. The Burmese government detained and kept Suu Kyi imprisoned because it viewed her as someone “likely to undermine the community peace and stability” of the country, and used both Article 10(a) and 10(b) of the 1975 State Protection Act (granting the government the power to imprison people for up to five years without a trial), and Section 22 of the “Law to Safeguard the State Against the Dangers of Those Desiring to Cause Subversive Acts” as legal tools against her. She continuously appealed her detention, and many nations and figures continued to call for her release and that of 2,100 other political prisoners in the country. On 12 November 2010, days after the junta-backed Union Solidarity and Development Party (USDP) won elections conducted after a gap of almost 20 years, the junta finally agreed to sign orders allowing Suu Kyi’s release, and Suu Kyi’s house arrest term came to an end on 13 November 2010. The United Nations (UN) has attempted to facilitate dialogue between the junta and Suu Kyi. On 6 May 2002, following secret confidence-building negotiations led by the UN, the government released her; a government spokesman said that she was free to move “because we are confident that we can trust each other”. Aung San Suu Kyi proclaimed “a new dawn for the country”. However on 30 May 2003 in an incident similar to the 1996 attack on her, a government-sponsored mob attacked her caravan in the northern village of Depayin, murdering and wounding many of her supporters. Aung San Suu Kyi fled the scene with the help of her driver, Ko Kyaw Soe Lin, but was arrested upon reaching Ye-U. The government imprisoned her at Insein Prison in Rangoon. After she underwent a hysterectomy in September 2003, the government again placed her under house arrest in Rangoon. The results from the UN facilitation have been mixed; Razali Ismail, UN special envoy to Burma, met with Aung San Suu Kyi. Ismail resigned from his post the following year, partly because he was denied re-entry to Burma on several occasions. Several years later in 2006, Ibrahim Gambari, UN Undersecretary-General (USG) of Department of Political Affairs, met with Aung San Suu Kyi, the first visit by a foreign official since 2004. He also met with Suu Kyi later the same year. On 2 October 2007 Gambari returned to talk to her again after seeing Than Shwe and other members of the senior leadership in Naypyidaw. State television broadcast Suu Kyi with Gambari, stating that they had met twice. This was Suu Kyi’s first appearance in state media in the four years since her current detention began. Such claims were rejected by Brig-General Khin Yi, Chief of Myanmar Police Force (MPF). On 18 January 2007, the state-run paper New Light of Myanmar accused Suu Kyi of tax evasion for spending her Nobel Prize money outside of the country. The accusation followed the defeat of a US-sponsored United Nations Security Council resolution condemning Burma as a threat to international security; the resolution was defeated because of strong opposition from China, which has strong ties with the military junta (China later voted against the resolution, along with Russia and South Africa). In November 2007, it was reported that Suu Kyi would meet her political allies National League for Democracy along with a government minister. The ruling junta made the official announcement on state TV and radio just hours after UN special envoy Ibrahim Gambari ended his second visit to Burma. The NLD confirmed that it had received the invitation to hold talks with Suu Kyi. However, the process delivered few concrete results. 20 July 1989: Placed under house arrest in Rangoon under martial law that allows for detention without charge or trial for three years. 10 July 1995: Released from house arrest. 23 September 2000: Placed under house arrest. 6 May 2002: Released after 19 months. 30 May 2003: Arrested following the Depayin massacre, she was held in secret detention for more than three months before being returned to house arrest. 25 May 2007: House arrest extended by one year despite a direct appeal from U.N. Secretary-General Kofi Annan to General Than Shwe. 24 October 2007: Reached 12 years under house arrest, solidarity protests held at 12 cities around the world. 27 May 2008: House arrest extended for another year, which is illegal under both international law and Burma’s own law. 11 August 2009: House arrest extended for 18 more months because of “violation” arising from the May 2009 trespass incident. 13 November 2010: Released from house arrest. Protests led by Buddhist monks began on 19 August 2007 following steep fuel price increases, and continued each day, despite the threat of a crackdown by the military. On 22 September 2007, although still under house arrest, Suu Kyi made a brief public appearance at the gate of her residence in Yangon to accept the blessings of Buddhist monks who were marching in support of human rights. It was reported that she had been moved the following day to Insein Prison (where she had been detained in 2003), but meetings with UN envoy Ibrahim Gambari near her Rangoon home on 30 September and 2 October established that she remained under house arrest. U.S. Senator Jim Webb visiting Suu Kyi in 2009. Webb negotiated the release of John Yettaw, the man who trespassed in Suu Kyi’s home, resulting in her arrest and conviction with three years’ hard labour. On 3 May 2009, an American man, identified as John Yettaw, swam across Inya Lake to her house uninvited and was arrested when he made his return trip three days later. He had attempted to make a similar trip two years earlier, but for unknown reasons was turned away. He later claimed at trial that he was motivated by a divine vision requiring him to notify her of an impending terrorist assassination attempt. On 13 May, Suu Kyi was arrested for violating the terms of her house arrest because the swimmer, who pleaded exhaustion, was allowed to stay in her house for two days before he attempted the swim back. Suu Kyi was later taken to Insein Prison, where she could have faced up to five years confinement for the intrusion. The trial of Suu Kyi and her two maids began on 18 May and a small number of protesters gathered outside. Diplomats and journalists were barred from attending the trial; however, on one occasion, several diplomats from Russia, Thailand and Singapore and journalists were allowed to meet Suu Kyi. The prosecution had originally planned to call 22 witnesses. It also accused John Yettaw of embarrassing the country. During the ongoing defence case, Suu Kyi said she was innocent. The defence was allowed to call only one witness (out of four), while the prosecution was permitted to call 14 witnesses. The court rejected two character witnesses, NLD members Tin Oo and Win Tin, and permitted the defence to call only a legal expert. According to one unconfirmed report, the junta was planning to, once again, place her in detention, this time in a military base outside the city. In a separate trial, Yettaw said he swam to Suu Kyi’s house to warn her that her life was “in danger”. The national police chief later confirmed that Yettaw was the “main culprit” in the case filed against Suu Kyi. According to aides, Suu Kyi spent her 64th birthday in jail sharing biryani rice and chocolate cake with her guards. Her arrest and subsequent trial received worldwide condemnation by the UN Secretary General Ban Ki-moon, the United Nations Security Council, Western governments, South Africa, Japan and the Association of Southeast Asian Nations, of which Burma is a member. The Burmese government strongly condemned the statement, as it created an “unsound tradition” and criticised Thailand for meddling in its internal affairs. The Burmese Foreign Minister Nyan Win was quoted in the state-run newspaper New Light of Myanmar as saying that the incident “was trumped up to intensify international pressure on Burma by internal and external anti-government elements who do not wish to see the positive changes in those countries’ policies toward Burma”. Ban responded to an international campaign by flying to Burma to negotiate, but Than Shwe rejected all of his requests. On 11 August 2009 the trial concluded with Suu Kyi being sentenced to imprisonment for three years with hard labour. This sentence was commuted by the military rulers to further house arrest of 18 months. On 14 August, U.S. 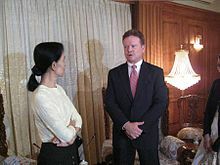 Senator Jim Webb visited Burma, visiting with junta leader Gen. Than Shwe and later with Suu Kyi. During the visit, Webb negotiated Yettaw’s release and deportation from Burma. Following the verdict of the trial, lawyers of Suu Kyi said they would appeal against the 18-month sentence. On 18 August, United States President Barack Obama asked the country’s military leadership to set free all political prisoners, including Aung San Suu Kyi. In her appeal, Aung San Suu Kyi had argued that the conviction was unwarranted. However, her appeal against the August sentence was rejected by a Burmese court on 2 October 2009. Although the court accepted the argument that the 1974 constitution, under which she had been charged, was null and void, it also said the provisions of the 1975 security law, under which she has been kept under house arrest, remained in force. The verdict effectively meant that she would be unable to participate in the elections scheduled to take place in 2010 – the first in Burma in two decades. Her lawyer stated that her legal team would pursue a new appeal within 60 days. It was announced prior to the Burmese general election that Aung San Suu Kyi may be released “so she can organize her party,” However, Suu Kyi was not allowed to run. On 1 October 2010 the government announced that she would be released on 13 November 2010. Burma’s relaxing stance, such as releasing political prisoners, was influenced in the wake of successful recent diplomatic visits by the US and other democratic governments, urging or encouraging the Burmese towards democratic reform. U.S. President Barack Obama personally advocated the release of all political prisoners, especially Aung San Suu Kyi, during the US-ASEAN Summit of 2009. Democratic governments[which?] hoped that successful general elections would be an optimistic indicator of the Burmese government’s sincerity towards eventual democracy. The Hatoyama government which spent 2.82 billion yen in 2008, has promised more Japanese foreign aid to encourage Burma to release Aung San Suu Kyi in time for the elections; and to continue moving towards democracy and the rule of law. In a personal letter to Suu Kyi, UK Prime Minister Gordon Brown cautioned the Burmese government of the potential consequences of rigging elections as “condemning Burma to more years of diplomatic isolation and economic stagnation”. The Burmese government has been granting Suu Kyi varying degrees of freedom throughout late 2009, in response to international pressure. She has met with many heads of state, and opened a dialog with the Minister of Labor Aung Kyi (not to be confused with Aung San Suu Kyi). Suu Kyi was allowed to meet with senior members of her NLD party at the State House, however these meeting took place under close supervision. Aung San Suu Kyi addresses crowds at the NLD headquarters shortly after her release. On the evening of 13 November 2010, Suu Kyi was released from house arrest. This was the date her detention had been set to expire according to a court ruling in August 2009 and came six days after a widely criticised general election. She appeared in front of a crowd of her supporters, who rushed to her house in Rangoon when nearby barricades were removed by the security forces. The Nobel Peace Prize laureate had been detained for 15 of the past 21 years. The government newspaper New Light of Myanmar reported the release positively, saying she had been granted a pardon after serving her sentence “in good conduct”. The New York Times suggested that the military government may have released Suu Kyi because it felt it was in a confident position to control her supporters after the election. The role that Suu Kyi will play in the future of democracy in Burma remains a subject of much debate. Discussions were held between Suu Kyi and the Burmese government during 2011, which led to a number of official gestures to meet her demands. In October, around a tenth of Burma’s political prisoners were freed in an amnesty and trade unions were legalised. In November 2011, following a meeting of its leaders, the NLD announced its intention to re-register as a political party in order to contend 48 by-elections necessitated by the promotion of parliamentarians to ministerial rank. Following the decision, Suu Kyi held a telephone conference with U.S. President Barack Obama, in which it was agreed that Secretary of State Hillary Clinton would make a visit to Burma, a move received with caution by Burma’s ally China. On 1 December 2011, Suu Kyi met with Hillary Clinton at the residence of the top-ranking US diplomat in Yangon. On 21 December 2011, Thai Prime Minister Yingluck Shinawatra met Suu Kyi in Yangoon, becoming Suu Kyi’s “first-ever meeting with the leader of a foreign country”. On 5 January 2012, British Foreign Minister William Hague met Aung San Suu Kyi and his Burmese counterpart. This represented a significant visit for Suu Kyi and Burma. Suu Kyi studied in the UK and maintains many ties there, whilst Britain is Burma’s largest bilateral donor. Aung San Suu Kyi is on her visit to Europe and is due to visit the Swiss parliament and collect her 1991 Nobel Prize in Oslo. Aung San Suu Kyi (Center) gives speech to the supporters during 2012 by-election campaign at her constituency Kawhmu township, Myanmar on 22 March 2012. In an official campaign speech broadcast on Burmese state television’s MRTV on 14 March 2012, Suu Kyi publicly campaigned for reform of the 2008 Constitution, removal of restrictive laws, more adequate protections for people’s democratic rights, and establishment of an independent judiciary. The speech was leaked online a day before it was broadcast. A paragraph in the speech, focusing on the Tatmadaw‘s repression by means of law, was censored by authorities. I can tell you one thing – that under the present constitution, if you become a member of the government you have to vacate your seat in the national assembly. And I am not working so hard to get into parliament simply to vacate my seat. On 1 April 2012, the NLD announced that Suu Kyi had won the vote for a seat in Parliament. A news broadcast on state-run MRTV, reading the announcements of the Union Election Commission, confirmed her victory, as well as her party’s victory in 43 of the 45 contested seats, officially making Suu Kyi the Leader of the Opposition in the lower house. On 2 May 2012, National League for Democracy MP-elects, including Aung San Suu Kyi, took their oaths and took office, though the wording of the oath was not changed. According to the Los Angeles Times, “Suu Kyi and her colleagues decided they could do more by joining as lawmakers than maintaining their boycott on principle.” On 9 July 2012, she attended the Parliament for the first time as a lawmaker. Some activists criticised Aung San Suu Kyi for her silence on the 2012 Rakhine State riots. After receiving a peace prize, she told reporters she did not know if the Rohingya could be regarded as Burmese citizens. Under the 1982 Citizenship Law, most Rohingya are unable to qualify for Burmese citizenship. As such, they are treated as illegal immigrants, with restrictions on their movement and withholding of land rights, education and public service. Some describe her stance as politically motivated. Aung San Suu Kyi greeting supporters from Bago State in 2011. Vietnam, however, did not support calls by other ASEAN member states for Myanmar to free Aung San Suu Kyi, state media reported Friday, 14 August 2009. The state-run Việt Nam News said Vietnam had no criticism of Myanmar’s decision 11 August 2009 to place Suu Kyi under house arrest for the next 18 months, effectively barring her from elections scheduled for 2010. “It is our view that the Aung San Suu Kyi trial is an internal affair of Myanmar”, Vietnamese government spokesman Le Dung stated on the website of the Ministry of Foreign Affairs. In contrast with other ASEAN member states, Dung said Vietnam has always supported Myanmar and hopes it will continue to implement the “roadmap to democracy” outlined by its government. The Norwegian Nobel Committee has decided to award the Nobel Peace Prize for 1991 to Aung San Suu Kyi of Myanmar (Burma) for her non-violent struggle for democracy and human rights. …In awarding the Nobel Peace Prize for 1991 to Aung San Suu Kyi, the Norwegian Nobel Committee wishes to honour this woman for her unflagging efforts and to show its support for the many people throughout the world who are striving to attain democracy, human rights and ethnic conciliation by peaceful means. In 1995 Aung San Suu Kyi delivered the keynote address at the Fourth World Conference on Women in Beijing. Nobel Peace Prize winners (Archbishop Desmond Tutu, the Dalai Lama, Shirin Ebadi, Adolfo Pérez Esquivel, Mairead Corrigan, Rigoberta Menchú, Prof. Elie Wiesel, U.S. President Barack Obama, Betty Williams, Jody Williams and former U.S. President Jimmy Carter) called for the rulers of Burma to release Suu Kyi in order to “create the necessary conditions for a genuine dialogue with Daw Aung San Suu Kyi and all concerned parties and ethnic groups in order to achieve an inclusive national reconciliation with the direct support of the United Nations.” Some of the money she received as part of the award helps fund London-based charity Prospect Burma, which provides higher education grants to Burmese students. On 16 June 2012, Aung San Suu Kyi was finally able to deliver her Nobel acceptance speech (Nobel lecture) at Oslo’s City Hall, two decades after being awarded the peace prize. Freedom Now, a Washington, D.C.-based non-profit organisation, was retained in 2006 by a member of her family to help secure Aung San Suu Kyi’s release from house arrest. The organisation secured several opinions from the UN Working Group on Arbitrary Detention that her detention was in violation of international law; engaged in political advocacy such as spearheading a letter from 112 former Presidents and Prime Ministers to UN Secretary-General Ban Ki-moon urging him to go to Burma to seek her release, which he did six weeks later; and published numerous opeds and spoke widely to the media about her ongoing detention. Its representation of her ended when she was released from house arrest on 13 November 2010. Aung San Suu Kyi has been an honorary board member of International IDEA and ARTICLE 19 since her detention, and has received support from these organisations. The Vrije Universiteit Brussel and the Université catholique de Louvain, both located in Belgium, granted her the title of Doctor Honoris Causa. In 2003, the Freedom Forum recognised Suu Kyi’s efforts to promote democracy peacefully with the Al Neuharth Free Spirit of the Year Award, in which she was presented over satellite because she was under house arrest. She was awarded one million dollars. In June of each year, the U.S. Campaign for Burma organises hundreds of “Arrest Yourself” house parties around the world in support of Aung San Suu Kyi. At these parties, the organisers keep themselves under house arrest for 24 hours, invite their friends, and learn more about Burma and Aung San Suu Kyi. The Freedom Campaign, a joint effort between the Human Rights Action Center and US Campaign for Burma, looks to raise worldwide attention to the struggles of Aung San Suu Kyi and the people of Burma. The Burma Campaign UK is a UK based NGO (Non Governmental Organisation) that aims to raise awareness of Burma’s struggles and follow the guidelines established by the NLD and Aung San Suu Kyi. St. Hugh’s College, Oxford, where she studied, had a Burmese theme for their annual ball in support of her in 2006. The University later awarded her an honorary doctorate in civil law on 20 June 2012 during her visitation on her alma mater. Aung San Suu Kyi is the official patron of The Rafto Human Rights House in Bergen, Norway. She received the Thorolf Rafto Memorial Prize in 1990. She was made an honorary free person of the City of Dublin, Ireland in November 1999, although a space had been left on the roll of signatures to symbolize her continued detention. In November 2005 the human rights group Equality Now proposed Aung Sun Suu Kyi as a potential candidate, among other qualifying women, for the position of U.N. Secretary General. In the proposed list of qualified women Suu Kyi is recognised by Equality Now as the Prime Minister-Elect of Burma. The UN’ special envoy to Myanmar, Ibrahim Gambari, met Aung San Suu Kyi on 10 March 2008 before wrapping up his trip to the military-ruled country. Aung San Suu Kyi was an honorary member of The Elders, a group of eminent global leaders brought together by Nelson Mandela. Her ongoing detention meant that she was unable to take an active role in the group, so The Elders placed an empty chair for her at their meetings. The Elders have consistently called for the release of all political prisoners in Burma. Upon her election to parliament, she stepped down from her post. In 2008, Burma’s devoted human rights leader and Nobel Peace Prize, was welcomed as Club of Madrid Honorary Member. In 2011, Aung San Suu Kyi was named the Guest Director of the 45th Brighton Festival. She was part of the international jury of Human Rights Defenders and Personalities who helped to choose a universal Logo for Human Rights in 2011. In June 2011, the BBC announced that Aung San Suu Kyi was to deliver the 2011 Reith Lectures. The BBC covertly recorded two lectures with Aung San Suu Kyi in Burma, which were then smuggled out of the country and brought back to London. The lectures were broadcast on BBC Radio 4 and the BBC World Service on 28 June 2011 and 5 July 2011. In November 2011, Suu Kyi received Francois Zimeray, France’s Ambassador for Human Rights. 8 March 2012, Canadian Foreign Affairs Minister John Baird presented Aung San Suu Kyi a certificate of honorary Canadian citizenship and an informal invitation to visit Canada. In April 2012, British Prime Minister David Cameron became the first leader of a major world power to visit Aung San Su Kyi and the first of a British prime minister since the 1950s. In his visit, Cameron invited San Su Kyi to Britain where she would be able to visit her ‘beloved’ Oxford, an invitation which she later accepted. She visited Britain on 19 June 2012. In May 2012, Suu Kyi received the inaugural Václav Havel Prize for Creative Dissent of the Human Rights Foundation. 29 May 2012 PM Manmohan Singh of India visited Aung San Suu Kyi. In his visit, PM invited San Suu Kyi to India as well. 18 June 2012 Suu Kyi was photographed by world-renowned visual artist Kevin Abosch in Dublin, Ireland. This entry was posted in Rotary Peace Forum, Speaker on 30 January, 2013 by Peacefull. Holly Mosher spoke of Muhammad Yunus Vision people may recall he is the founder of Grameen Bank and has developed other projects to help empower people with access to solar panels, micro credit, removing night blindness for children (healthy green vegetables) and developing social businesses (see below). Muhammad one the Nobel Peace Prize for his work impacting the third world and the empowerment of women. He has found by tapping into women, change happens. Molly shared her journey as a filmmaker and how filmakers can create peace by telling the stories of those who are creating the change in the world, in positive empowering ways. Her film is called Bonsai. This is about the planting of a seed and when contained in a pot becomes a Bonsai. Funded! This project successfully raised its funding goal on May 3, 2011. What if you could harness the power of the free market to solve the problems of poverty, hunger, and inequality? To some, it sounds impossible. But Nobel Peace Prize winner Muhammad Yunus is doing exactly that. BONSAI looks deeply at Yunus’ extraordinary humanitarian work, which started when he simply lent $27 to 42 people out of his own pocket. As the founder of Grameen Bank, Yunus pioneered microcredit, the innovative banking program that provides poor people – mainly women – with small loans they use to launch businesses and lift their families out of poverty. His Grameen Bank currently lends to one out of every 1,000 people on Earth and with a 98% rate of return – unheard of in the financial world. But Muhammad Yunus didn’t stop there. Now, he’s gone beyond microcredit to pioneer the idea of social business – a completely new way to use the creative vibrancy of business to tackle social problems from poverty and pollution to inadequate health care and lack of education. BONSAI offers a glimpse into his visionary work. While Muhammad Yunus didn’t invent the notion of doing business for social good – it is a concept that needed a leader and Yunus has become that person. And BONSAI is the feature length documentary film that is going to be his megaphone. BONSAI received a grant to make the film, but we still need finishing funds and money to share it with the world. We still need to pay the composer, sound designer, graphics artist, dvd manufacturer and lastly and most importantly ignite a word of mouth campaign to get people to see this important film. We are excited to share how microcredit and social business work and how it can be replicated successfully around the globe. We are looking for and excited about creating partnerships with like minded individuals and organizations to really ignite this new social movement. Join us in the new social business movement today! This entry was posted in Media, Peace educator, Rotary Peace Forum, Speaker on 30 January, 2013 by Peacefull. Robert Scott spoke at the Rotary Peace Forum in Hawaii. He indicated that Rotary was very close to eradicating polio. Interestingly, Holly Mosher a social entrepreneur made a suggestion during her speech for women to be involved in immunisation, similar to the micro credit. I thought it was a good idea. Polio has been the mainstay of Rotary and its complete irradication is their goal. They are indeed very close only two countries in the world left to remove polio. This is an article by Bob Scott speaking about polio irradication barriers in Pakistan. He spoke of this issue in his talk and there were moments he felt afraid given opposition and mindsets that feel threatened by health workers. He showed an amazing photo of a Taliban offering polio drops to a child, it was indeed a beautiful photo. Imagine if we can bring all disparate parties together for the benefit of children. The shooting victims are among the thousands of health workers and volunteers — including members of Pakistan’s 151 Rotary clubs — who are committed to saving children by stopping the transmission of polio in Pakistan, one of three countries where the crippling virus remains endemic.